Wilderness is situated centrally in the Garden Route, and therefore it’s an ideal starting point for exploring different tourist attractions in the area. It is set between the Outeniqua Mountains and the warm waters of the Indian Ocean. Wilderness is a birdwatcher’s and nature-lover’s paradise and is the only village in South Africa that, together with the lakes, surrounding forests and 28 kilometers of coastline, is protected within a 2612-hectares National Park. There are more then 150 different species of birds in this area, so go for a hike and explore the unique flora and fauna of this magnificent area! Wilderness offers over 18 km of golden sand, ideal for a leisurely stroll. Come and see our beautiful beaches at Leentjiesklip, Touws River Mouth and the Boardwalk on 6th Avenue. The Fisherman’s Walk on 8th Avenue is very close by and Kleinkrantz will be perfect for fishing, sunbathing, surfing or a leisurely stroll. The famous “Map of Africa Viewpoint” offers fantastic view of the Kaaimans River Valley. The setting of the river flowing around the hill makes the view look like a map of Africa. The views on both sides are awesome. To the right is the “Map of Africa Viewpoint” and to the left is a paragliding take-off spot that offers spectacular views of the Wilderness beaches. Another great viewpoint is “Dolphin View Point” which gives a magnificent view of the ocean for miles and was named after the number of dolphins which can be spotted from here on a regular basis as well as whales between June and November which is their breeding season. The Kaaimans River Bridge is known as an excellent spot for taking photographs of the scenery. The “Seven Passes Road” also known as The Old George – Knysna Road, is a 75-kilometre-long trip that takes you past 7 gorges cut deep by rivers flowing to the sea. Follow this scenic route from George to Knysna. It winds its way through an indigenous forest, over historic stone bridges and through lush farmlands. The “Woodville Tree” on the Seven Passes Road is another attraction in the area. The “Big Tree” is a yellowwood tree estimated to be 850-years old. It creates shaded areas with its massive branches, making it a great picnic spot. Located on the seaside cliffs close to the Kaaiman’s River Mouth there is the “Kaaimans Grotto”, in the past a very popular restaurant only reachable via the Outeniqua Choo-Tjoe train, now the home of a real life caveman living in it. It’s like a fairytale wonderland, full of hanging shells and rooms full of interesting arty pieces. Follow the railway line by foot and you cross the Kaaiman’s river bridge. Views from this bridge over the river and Indian Ocean, with the hillside as backdrop, is absolutely spectacular. 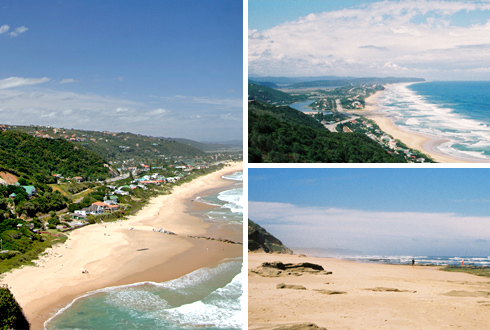 After about 2 km you reach Victoria Bay- famous for swimming and surfing! The area is ideal for outdoor activities like boatrides, hiking and mountain biking in the Wilderness National Park, horse-riding through the beautiful indigenous forest, water-skiing at Island Lake and Swartvlei, canoeing the rivers and waterways, kloofing, abseiling the cliffs and fishing the river or the sea. Wilderness is considered South Africa’s best site for coastal flying. Experience the exciting challenge of paragliding above the coastline. There are very professional paragliding schools in Wilderness…we can put you in contact with them. Even for a 75-years-old beginner, it is a great experience! Rent a canoe with which you can explore the placid waters of Island Lake, Wilderness Lagoon and the scenic Touw River. The most popular is to paddle up the river and then walk the easy trail through the forest to the Touw River Waterfall. After about 45 minutes of canoeing and 45 minutes of walking on a stunning new boardwalk you will reach the beautiful waterfall. Relax, swim, picnic and return via the same way – a great way to spend a morning or afternoon. Every Friday there is a night market in the Milkwood Village in Wilderness. This event boasts local live music, beautiful crafts and an awesome vibe. Every Saturday mornings you can visit the Wild Oats Farmer’s Market in Sedgefield (15 minute drive towards Knysna). This is well worth attending, with plenty of interesting things to buy and a wonderful farmer’s market selling everything from organic honey to superb cheeses – ideal to stock up for a picnic! Also on Saturday mornings (from 8 am to 2 pm) there is the Outeniqua Farmer’s Market in George. It is the home to more than 125 food and craft stalls offering produce and goods created by local farmers and skilled craft people.